This Week's VR Game Roundup – Shoot to the Beat, Stop Soccer Balls, and More! Combining elements of the first-person shooter, rhythm, and bullet hell genres, Gun Beat will push your VR gaming capabilities to the limits. Using motion-tracking controllers on either Rift or Vive, you must blast away at the enemies on screen. Unlike in other shooters, however, you’ll be judged on how well you can match your shots to the music’s beat, all while avoiding incoming fire. Gun Beat requires you to move your arms from side to side as you aim at the enemies displayed on your headset, and you have to lean in multiple directions in order to avoid taking damage from projectiles. Though playable sitting down, it also supports a standing orientation for a more intense workout. 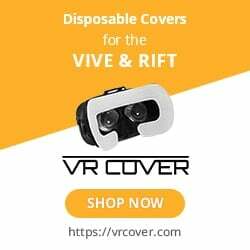 With only two buttons, those with limited or no VR experience can also enjoy it. Set in a futuristic utopia on the brink of collapse after an equipment malfunction, Rainbow Reactor tasks you with keeping the city’s population save from disaster as you operate a reactor loaded with powerful chromium. By combining the energy of multiple chromium spheres, you can change their color, and then you must accurately throw them into their corresponding slots. Rainbow Reactor can be played in a room-scale VR setup, and it requires you to throw virtual objects several times in order to complete each puzzle. It requires the use of motion controllers, and will test your ability to place your shots carefully in a manner similar to basketball. PlayStation VR has become the home to several of the best VR games, and you can try them out without spending a dime through the PlayStation VR Demo Disc 3. Also available as a download on the PlayStation Network, the bundle includes demo modes for Astro Bot Rescue Mission, Battlezone, Headmaster, Job Simulator, Moss, Kitchen, Superhot VR, the Persistence, and Thumper. Games vary in terms of fitness functionality, with the more action-packed inclusions support PlayStation Move controllers for more accurate and lifelike aiming. Job Simulator and Superhot VR both require careful hand-eye coordination, and Headmaster is a soccer game that trains you to stop close-range kicks. Pizza and soda aren’t the healthiest to eat or drink, but throwing them as quickly as possible can still give the delivery driver a workout. Your goal is to do with precision and speed, and Temple of Pizza requires you to stand as you play. The shots vary in their location, so you’ll be working out your entire arms. Just hold back the urge to have actual pizza after you’re done playing it.